Here's a Charm Bracelet that is fun to wear and looks great with just about everything. Wear it for work or play! It is a perfect piece to wear with denim! 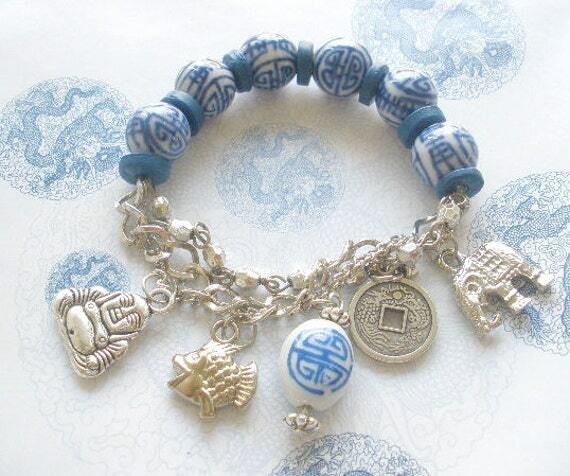 This charm bracelet is made with blue and white porcelain beads hand painted with the symbol for double happiness. There are five charms: a Buddha, fish for prosperity, porcelain double happiness, Chinese coin for wealth, and an elephant for good luck. The beads are on Stretch Magic cord and attached to three different chains. Size - small to medium. The Chinese porcelain beads are reminiscent of the antique dynasty porcelains which are famous throughout the world. The beads have been hand painted with Chinese characters representing longevity, happiness, wealth, love, and good fortune. The blue & white porcelain became well developed in the Yuan Dynasty (1271-1368), but flourished in the Ming and Qing Dynasties. First natural cobalt was painted on the basic body. Then it would turn blue after being fired at high temperatures. The white glaze covered by a clear glaze highlighted the blue designs. The blue & white porcelain vases, plates, decorative items, and beads are different and unique. These earrings would coordinate with the bracelet: http://www.etsy.com/listing/6648178/good-luck-earrings.